We were asked to give advice on the fifteenth century Papal Bull held by Tain Through Time, the museum of Tain & District. The Papal Bull, dated 17th July 1492, confirms the status of the Collegiate Kirk of St Duthac of Tain so is important to the town and generates a lot of public interest. 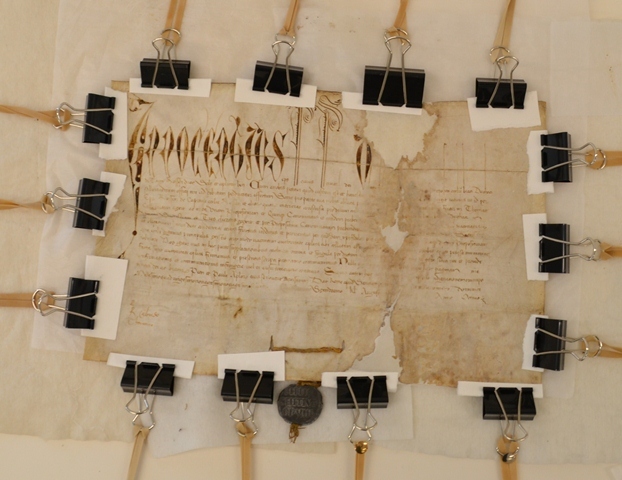 Museum staff had noticed stresses and delamination on the document and they were anxious to preserve the Tain Papal Bull in the best possible condition for future generations. 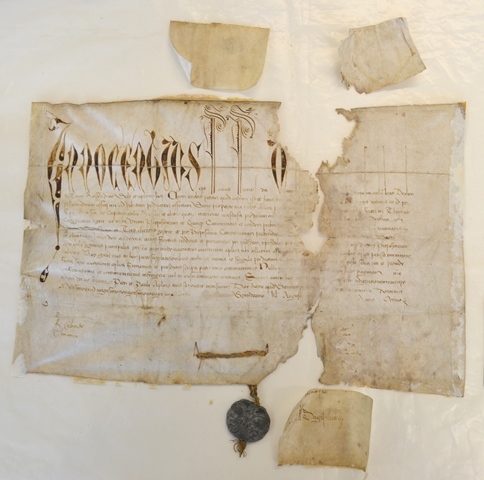 We assessed the parchment document, which included a large lead pendant seal and quoted for the required conservation treatments to ensure its preservation. 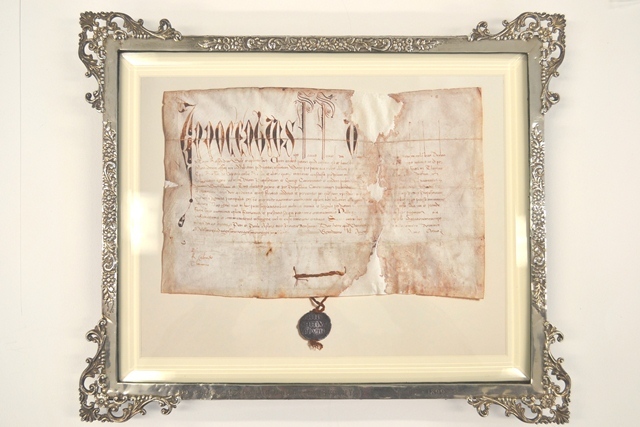 A crowdfunding website was created by Tain Through Time to source the funds of £800 to cover the conservation and the creation of a digital facsimile of the Tain Papal Bull. The crowdfunding site captured the imagination of the public and generated nation-wide publicity. 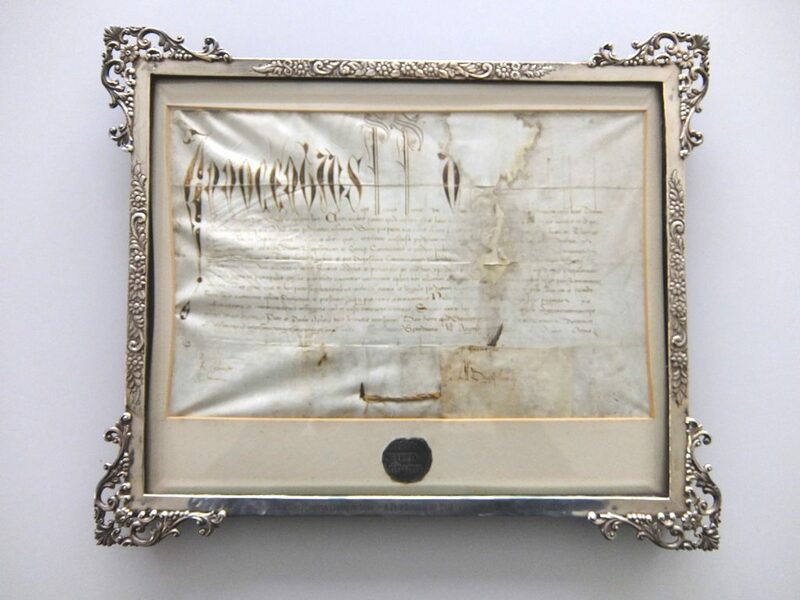 When we began the work necessary for its conservation we noted the document had previously been repaired in 1899 before it was framed, using wheat starch paste as the adhesive and three square patches of parchment for the repair. Stresses were caused by the document being adhered to a mount support, which prevented it from moving with air and temperature fluctuations. 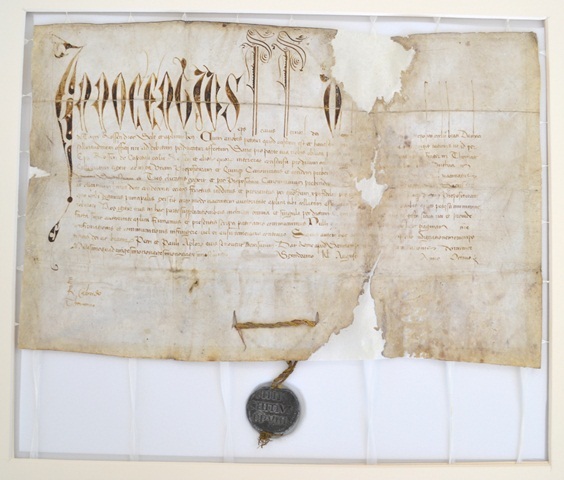 We carried out repairs to the document in Highland Archive Centre’s Conservation Studio, paring a new piece of parchment to support the document, before adhering it in place using gelatine adhesive. The Tain Papal Bull is now stored in a protective archival box in a secure ambient environment, which will retard any further deterioration. A digital facsimile has been produced, printed and mounted in the original frame. Tain Through Time can now exhibit the facsimile permanently, whilst bringing out the original only when required; the document has been transcribed in various languages.